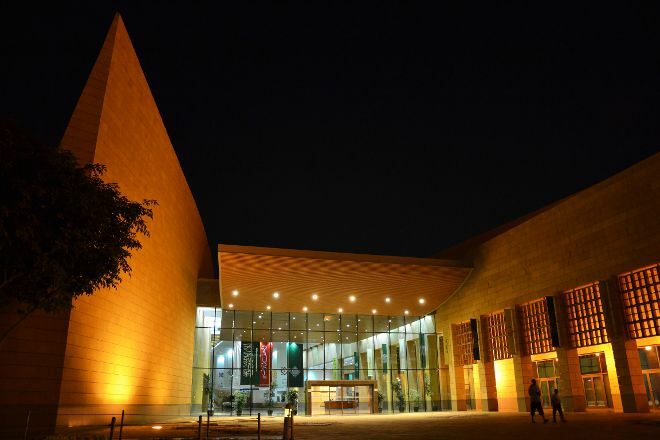 Learn about the history of Saudi Arabia at King Abdulaziz Historical Center, a geographical and cultural center home to many different museums. The area aims to promote the historical awareness of the Arabian Peninsula while also illustrating its religious connection to Islam. A park surrounds the buildings with lush plant life and open spaces. The national museum serves as the main attraction, providing a spiritual as well as historical journey starting with the creation of man. Other buildings include a palace and mosque. Grab a bite to eat at the top of the tower to see far-reaching views of the city. For King Abdulaziz Historical Center and beyond, use our Riyadh trip planning website to get the most from your Riyadh vacation. Great museum. We stopped to read almost all the items. Amazing collection of history and description of the present. Make sure you see all the sections and allow ample time. This place has all the historical artifacts I am very much impressed. They even have a theatre for displaying the historical places the technology is amazing. The historical weapons and the manuscripts are like never seen before. I loved it. Every time I visit the place it becomes more attractive. It is situated in the Center of Saudi Arabian capital Riyadh. It have museum, lush green grassy lawns and water spots for kids. I always love to visit this place either with family or friends. Every day, we help thousands of travelers plan great vacations. Here are some tips on how to use your Listing Page to attract more travelers to your business - King Abdulaziz Historical Center. Promote your permanent link - https://www.inspirock.com/saudi-arabia/riyadh/king-abdulaziz-historical-center-a3152854697 - on your website, your blog, and social media. When a traveler builds a plan from this page, the itinerary automatically includes King Abdulaziz Historical Center. This is a great way for travelers looking for a great vacation in your city or country to also experience King Abdulaziz Historical Center. Promoting your link also lets your audience know that you are featured on a rapidly growing travel site. In addition, the more this page is used, the more we will promote King Abdulaziz Historical Center to other Inspirock users. For best results, use the customized Trip Planning Widget for King Abdulaziz Historical Center on your website. It has all the advantages mentioned above, plus users to your site can conveniently access it directly on your site. Visitors to your site will appreciate you offering them help with planning their vacation. Setting this up takes just a few minutes - Click here for instructions.